"I'm happy. 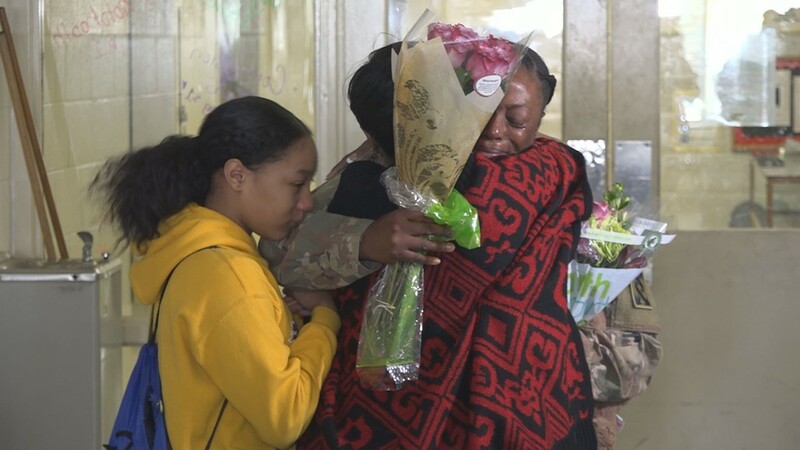 I'm surprised.I just have a whirlwind of emotions going through me right now," said Major Dianna Pegeuese. "I'm just glad to be back home, finally." 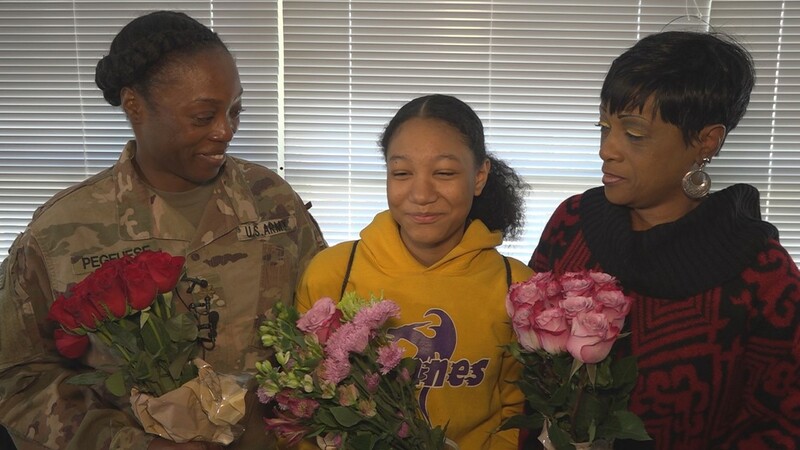 WINSTON-SALEM, N.C. — It's a heartwarming homecoming. 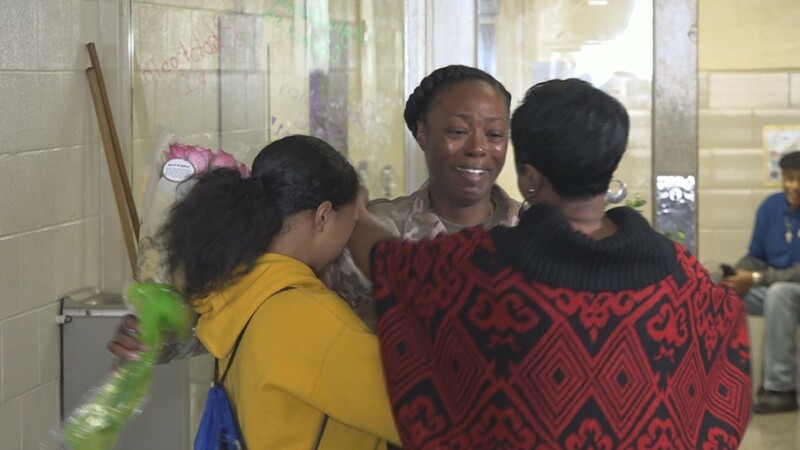 A military mom surprised her daughter at school. 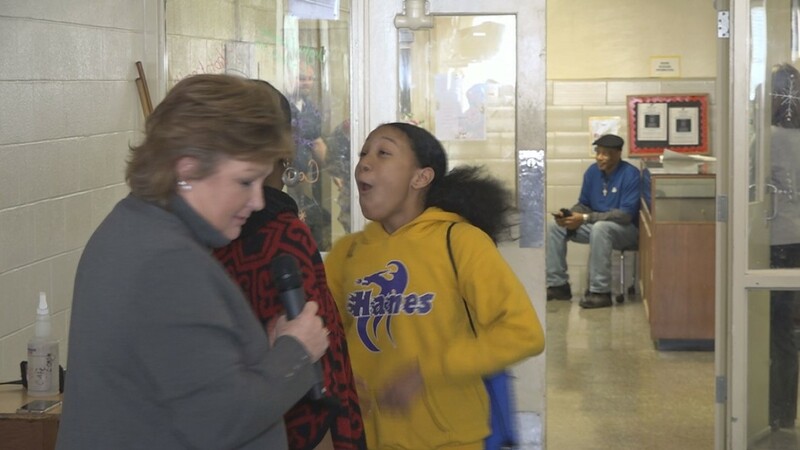 It happened Wednesday morning at Hanes Magnet Middle in Winston-Salem. Major Dianna Pegeuese is a Public Affairs Officer for the U.S. military. 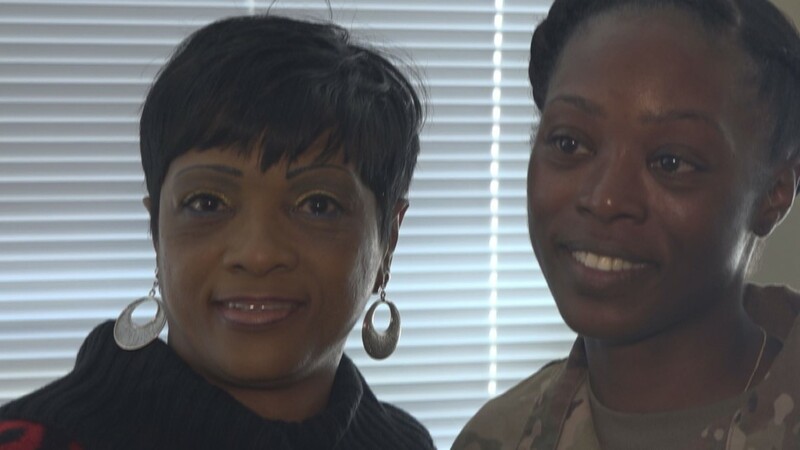 She has been serving in Kuwait since early 2017. "I tell the Army story to the target audience - the American public - so that they can know what our soldiers are doing," said Major Pegeuese. "I'm behind the camera. I'm normally writing stories or taking pictures for soldiers to share with their families." 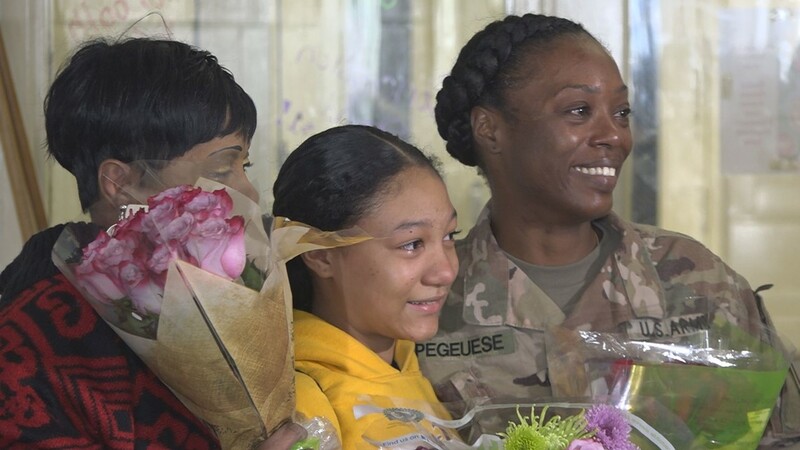 But, Major Pegeuese hasn't seen her own family in over a year. She says it's the longest time she's ever been away from both her daughter, Madison, and mother, Burnedette Pegeuese. 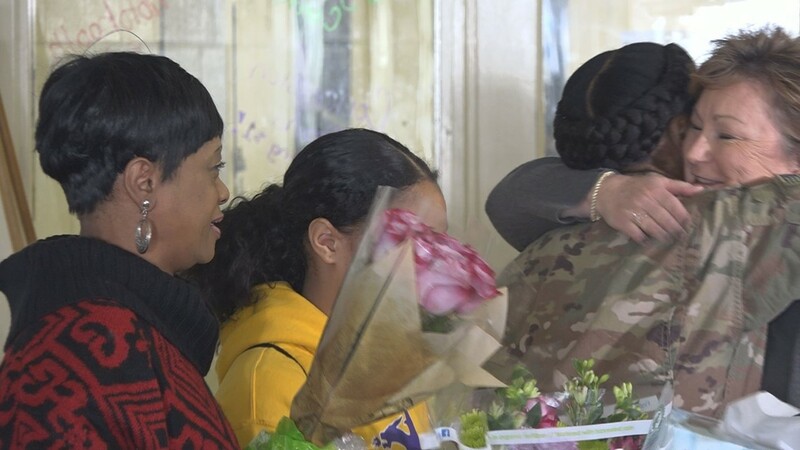 "I wanted to surprise my daughter at school," said Major Pegeuese. "At the same time, I also wanted to surprise my mom." 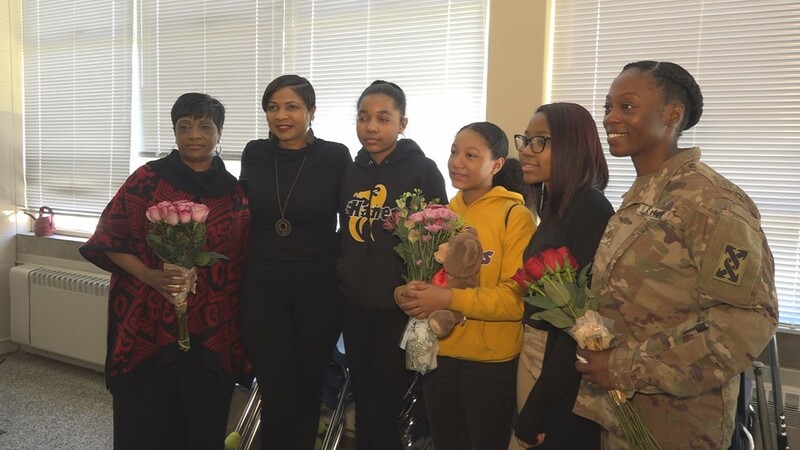 After learning about Major Pegeuese's plans to arrive in the Triad, school leaders quickly jumped into action. 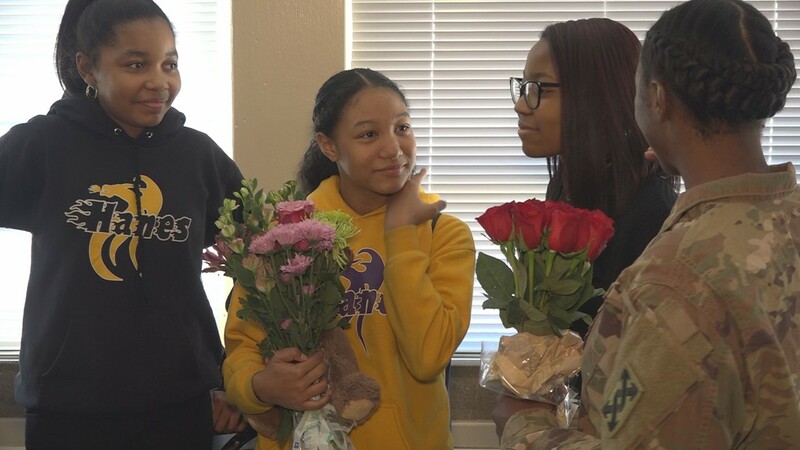 The school decided to host a homecoming surprise in front of students and staff members in the cafeteria during lunch. 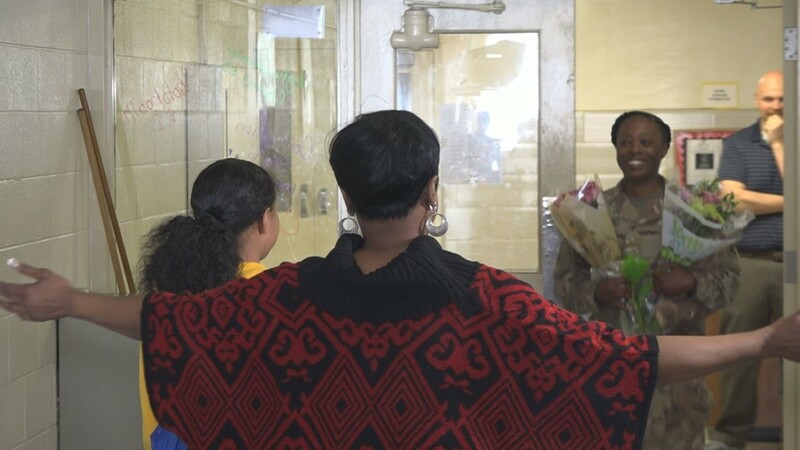 The surprise was disguised as a "Volunteer of the Year" ceremony. Burnedette Pegeuese heavily volunteers at the school, working in the media center, cafeteria, and handling car duties in the morning. School leaders informed Ms. Pegeuese that she was being awarded a "Volunteer of the Year" certificate. 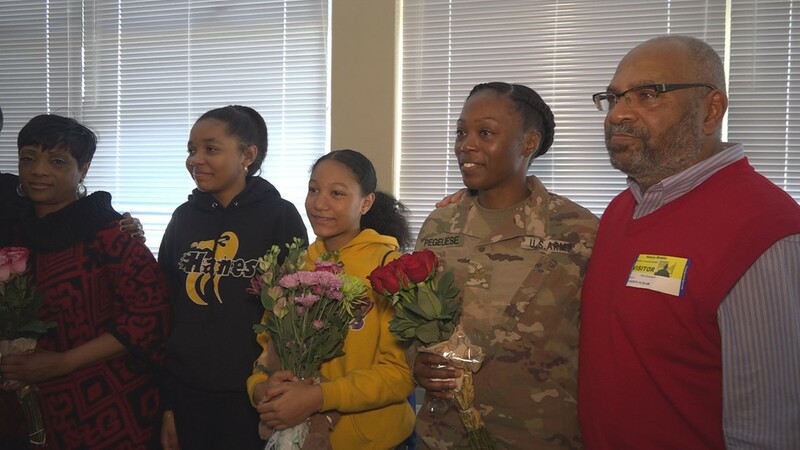 But, Ms. Pegeuese's true award was a surprise visit from her daughter in the military. "If I could have fainted, I would've," said Ms. Pegeuese. "But, I have to be a strong grandma. My birthday is Tuesday and this is the best birthday surprise that I have ever had." 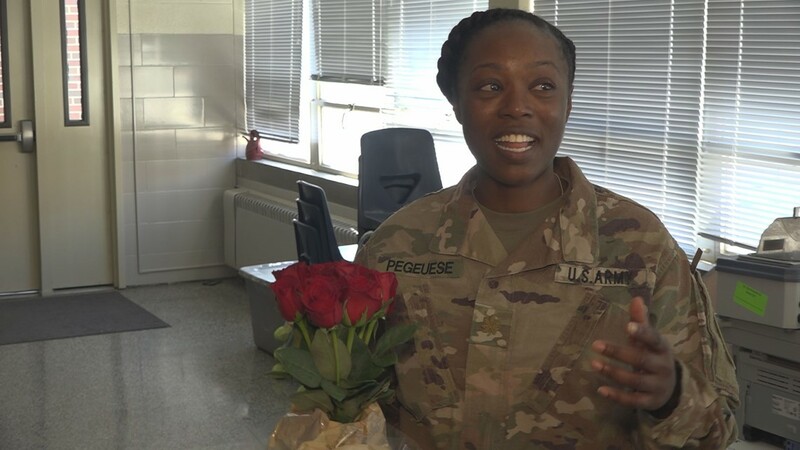 Major Pegeuese walked into the school cafeteria holding flowers for both her daughter and mother. In awe, the family cried and held each other tight. 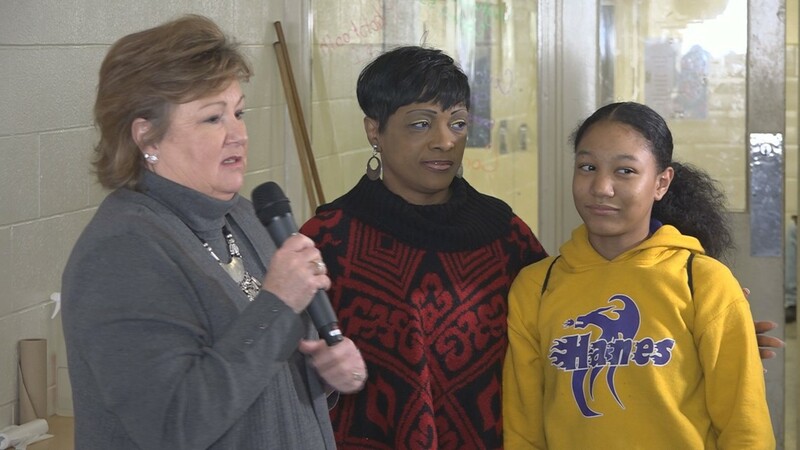 "It was an amazing opportunity," said Robin Willard, Hanes Magnet Middle Principal. 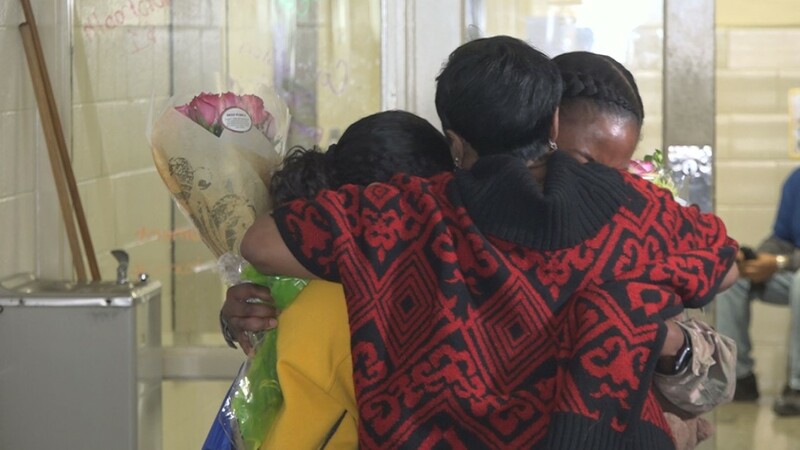 "It was so overwhelming to watch - everything unfold - because I knew how much Madison missed her mom and how much Ms. Pegeuese missed her daughter." Major Pegeuese will be in the Triad for only one week to visit loved ones. After that, she will be returning to continue serving the country. 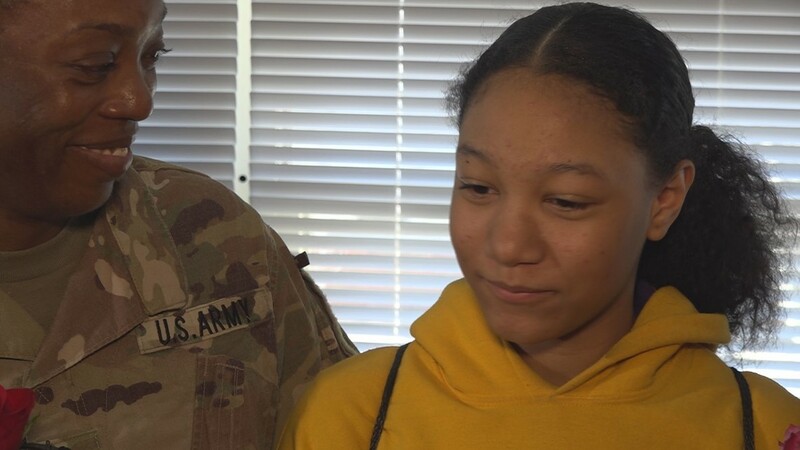 "It's a lot of emotions going on," said Madison. I just told my friends at lunch that what if it was my mom and it actually came true."